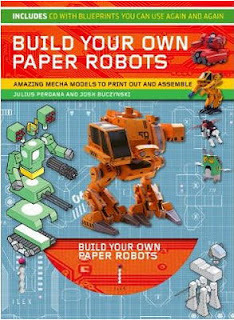 Back in August 2008, I was lucky enough to find a way to contribute to an awesome book project - the end result was "Build Your Own Paper Robots" by Ilex Press. It was the first book (first I'm aware of) to ever feature 3d paper robots that could be assembled and then posed over and over! All of the templates are included on the disk, in color and in black and white too -- great for coloring and customizing! It came out on the heels of "Urban Paper", another great book from the early rise of designer paper toys (along with "We Are Paper Toys"). One of my robots in the book is "Microbot", a 5.25" tall figure with 10 points of articulation, big, chunky fingers and an overall design that still looks good to me, even after all these years. Recently, Ilex was able to reprint the book, in a smaller size, but so far, it's only available in the UK. To celebrate the re-release, I'm UPGRADING Microbot and changing the way you can make it. There are also new details and toys for Microbot to hold. You will still need the original templates from the book though, so track down a copy if you like it! The new movement method is an important upgrade -- I'm sad to say that the old way of posing Microbot is prone to breakage and tearing -- I didn't learn about it till months after the book was out! I have a delicate touch with paper toys, and it wasn't until I showed Microbot to someone else... when he TWISTED the arm right off at the shoulder! The tiny paper disk axle delaminated, pulling the layers of paper apart! The worst part is that they don't glue back together well at all! Worry no more! 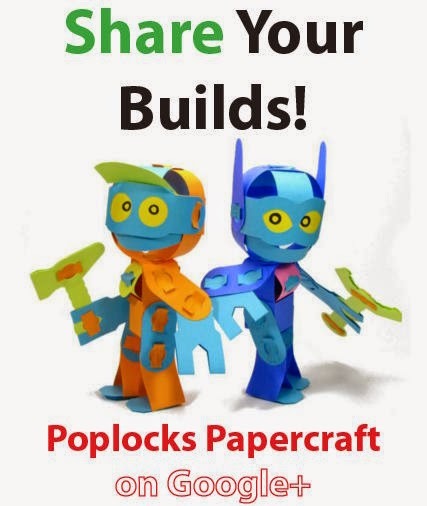 Download the Microbot Upgrade Patch PDF from this post, print it out, and also print out the template from your copy of "Build Your Own Paper Robots" -- now you can have Microbots built with Screw-In Flat Axle technology! It's durable; resists tearing forces much more reasonably and also has more friction in each joint! Here are the instructional images that will help you build the new and improved Microbot! cut it out. Use a knife to cut out the finger slots. the circuits of any un-shielded robot! the torso. Use a knife to remove the shapes with an "X"
in the middle. Also cut the notch lines. Use a knife to cut out the holes on all of the limb pieces. orient your placement of the flat axles. shoulder disk and the inside elbow disk.